March 2005. Originally released March 1995. 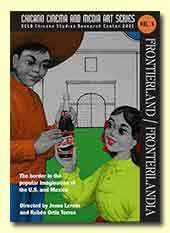 This DVD examines the multiple points of cultural contact between the United States and Mexico. From the Santa Barbara Fiestas and South Carolina's kitschy “South of the Border” tourist complex, to a Mexican Beatles cover band and Chicano rap, this film reveals the borderlands as a laboratory of hybridity that continues to ignite the popular imagination of each nation. Working at the boundaries of experimental film and documentary travelogue, this film weaves together found footage, interviews, performance art, and music video, producing a masterful commentary that is at once poetic, disturbing and hilarious. Includes appearances by Guillermo Gómez-Peña and Aztlán Underground, among others. This DVD is part of an ongoing Chicano Cinema Recovery Project in collaboration with the UCLA Film and Television Archive. DVD includes important bonus material on border culture and the filmmakers. Jesse Lerner is a documentary filmmaker based in Los Angeles. His films include T.S.H. (2004), The American Egypt (2001), and Ruins (1999). He has curated projects for the Robert Flaherty Seminar, the Centro Fotográfico Manuel Alvarez Bravo in Oaxaca, and the Guggenheim Museums in New York and Bilbao. He is currently professor of media studies at the Claremont Colleges. Rubén Ortiz-Torres is a Mexican-born artist living and working in Los Angeles. His work spans a diverse range of media including and often combining photography, film and video, sculpture, and customized cars and machines. Ortiz-Torres is currently a professor of visual arts at the University of California, San Diego.